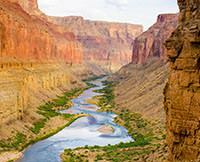 This Grand Canyon Vacation Was An Unforgettable Trip With Lots Of Beauty And Thrills. I had such a great time on this Grand Canyon vacation. The Colorado River water was refreshing, the moon full, and the scenery majestic. I will never forget the flash flood that came out of Suprise Canyon the last night of our trip. It got my blood pumping even more than the rapids!